Change things up with these side-trips from Sydney: Blue Mountains National Park (The National Pass, Windyridge Garden, & more), Katoomba (Wentworth Falls, Blue Mountains, & more) and Norman Lindsay Gallery & Museum (in Faulconbridge). Spend the 6th (Mon) exploring nature at Sydney Harbour National Park. Spend the 25th (Tue) exploring nature at Nattai National Park. 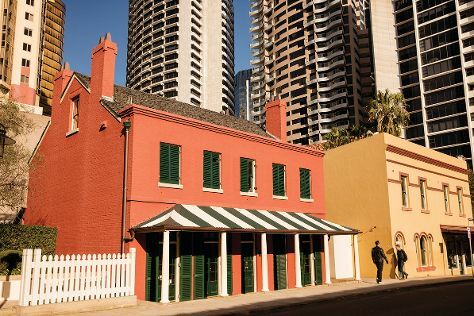 There's still lots to do: appreciate the extensive heritage of The Rocks, admire the landmark architecture of Sydney Opera House, enjoy the sand and surf at Manly Beach, and examine the collection at Australian National Maritime Museum. For more things to do, maps, reviews, and tourist information, go to the Sydney trip itinerary tool . If you are flying in from United Kingdom, the closest major airport is Sydney Kingsford Smith International Airport. In May, daily temperatures in Sydney can reach 24°C, while at night they dip to 14°C. Wrap up your sightseeing on the 30th (Sun) early enough to travel back home.